Our Nut Research Featured in Sunday’s Free Press! Nut trees serve and protect. ELMORE – Pears dropped with a distinct plunk as David Fried ambled through a varied crop of fruit and nut trees. Kiwi vines, black walnut trees, and hazelberts lined the path. Squirrels hoard the nuts, and deer eat the drops, but Fried, 56, isn’t easily goaded. “For us it’s something we like, but for them it’s survival,” he said. His 18 acres, once an abandoned hay field, is now an abundant Eden in Elmore. 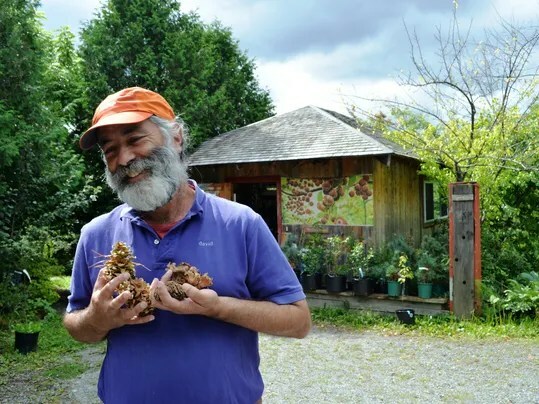 After being told only apples could grow this far north, Fried has discovered, over three decades of experimenting, what is possible for Vermont. His Elmore Roots Nursery has sold about 50,000 fruit and nut trees since he opened for business in 1979. These trees also protect Vermont’s changing landscape in the face of extreme weather patterns. One tree in particular, the Hazelbert, saved one farm during Tropical Storm Irene three years ago. Morris, 36, also owns Prospect Rock Permaculture, a landscape design and build firm that helps people plant protective infrastructure into their homesteads. Morris is on a mission to see more nut trees as shelter belts around vegetation, as wind breaks, animal fencing, and on river’s edges across the state. Fried’s certified organic nursery boasts eight different kinds of nut trees. He sells about 600 hazelnut, black walnut, pine nut, bur oak, shagbark hickory, butternut, buartnut and American chestnut annually. Nutella is a sweet spread made from hazelnuts that has replaced peanut butter in many homes across the nation recently. 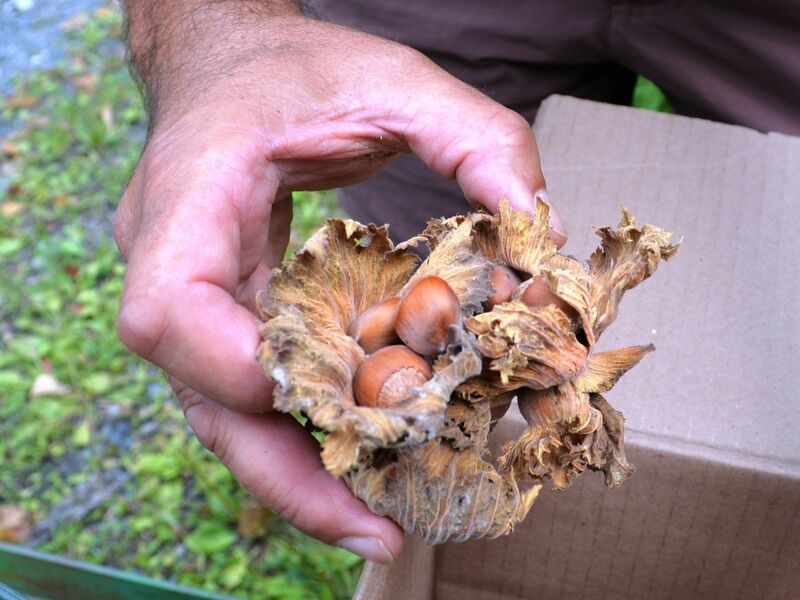 Hazelberts produce nuts within a few years of being planted as opposed to other nut trees that generally take about 10 to 15 years to produce, Morris said. Shelburne Farms Head Market Gardener, Josh Carter, has been growing Hazleberts in Shelburne for three years. “We’re thinking our Hazleberts will start producing enough nuts to sell to the Inn next year,” he said. The Hazleberts were planted to add interesting, non-traditional crops that fit with the farm’s educational mission. “Since we run a farm-to-table restaurant on site we diversity our market garden operation as much of possible for greatest variety in the menu,” Carter said. Nut farming is not economically viable, Carter said. “We don’t grow many nuts around here in the Northeast,” he said. Carter admits he doesn’t have a passion for growing nuts, in particular, but does have a passion for trying different crops and learning as he goes. Morris is also working on a hybrid pecan and hickory tree called a hickan tree. “People say pecans won’t grow in Vermont, but they do,” he said. 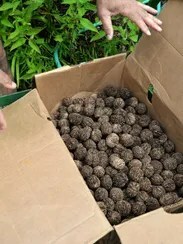 It might take 15 years to see nuts grow on a hickan tree, but there will be 500 years of nut harvesting after that, with no tilling, weeding, or seeding. “I hope my work will build a legacy, so that generations of Vermonters to come might have plenty of pecans,” Morris said. Contact Lynn Monty at LynnMonty@FreePressMedia.com and follow her on Twitter at http://www.twitter.com/VermontSongbird. Thank you Lynn for a great story! I will return and annotate/ correct this as there’s even more to the story! Stay tuned for an audio file of our Nuts for the Northeast presentation at NOFA MA- we’re also looking for someone who wants to collaborate on making a simple video from the slides or who would like to edit the audio. Thanks to everyone for coming out and sharing our event with DARREN DOHERTY! It was a great success. Out ROOT CELLAR DESIGN BUILD WORKSHOP will be October 18-19- stay tuned for more details or email to register!